Rick Jeanneret (Born 1942 in St. Catharines, Ontario, Canada) is the television and radio play-by-play announcer for the National Hockey League's Buffalo Sabres. Having started with the team on radio during the 1971–72 season, he is the longest-tenured announcer in the NHL. He began television duties during the 1995–96 season. 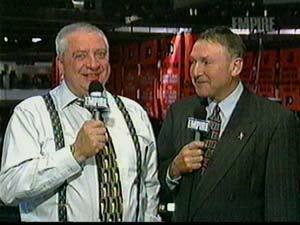 Jeanneret, a Canadian of Swiss descent, is known for his energetic delivery, colorful player nicknames, passionate goal calls, and his trademark suspenders worn on air. Although it is commonly said he was born in Switzerland, Jeanneret is actually a native of Canada. He worked alongside his partner Jim Lorentz for over 10 years before Lorentz retired. Harry Neale, former color commentator for the Toronto Maple Leafs regional broadcasts and current commentator on Hockey Night in Canada, is Jeanneret's partner for the MSG Network and WGR on most nights; Mike Robitaille will be with Jeanneret on Saturdays when Neale covers Hockey Night in Canada. ​In 1963, Jeanneret took over the play-by-play of a Niagara Falls Flyers Junior A hockey game for the regular announcer, who had become sick. Jeanneret became the color analyst the following season before assuming full-time play by play radio duties in 1965. In 1971, Jeanneret had a trial run doing the call for the Cincinnati Swords, the Sabres' top minor league affiliate. When the Sabres took the ice for their second season, for a game with the Pittsburgh Penguins at the Aud on October 10, 1971, Jeanneret was in the radio booth high above the ice surface. From 1984 until 1992, he did the Sabres' play-by-play in addition to being a popular early-morning disc jockey at CJRN-AM in Niagara Falls, Ontario. In 1992, he chose to retire from CJRN and concentrate solely on the Sabres. "I had enough of two jobs. I finished the game, came home and had to be up by 4 a.m.," he said. 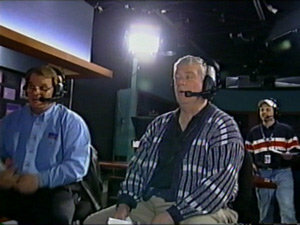 Jeanneret, whose own nickname is Rodney or RJ, helped close the Aud on the final night of the regular season in 1996 with an emotional tribute to his colleague Ted Darling, who was the voice of the Sabres from 1970 until worsening of his Pick's Disease forced him to retire in the midst of the 1991–92 season. "I wish that standing next to me right now would be Ted Darling," said Jeanneret from the ice surface in a postgame ceremony. "See you in September, one block in that direction," said Jeanneret, pointing toward the new arena, then dubbed the Crossroads Arena and now called HSBC Arena after a stint as Marine Midland Arena. In 2005, Jeanneret and the Sabres released a CD that collected some of his most memorable calls. Proceeds from the CD, which was titled Roll the Highlight Film, went to charity. It was followed up in 2006 with Top Shelf, a similarly themed DVD. 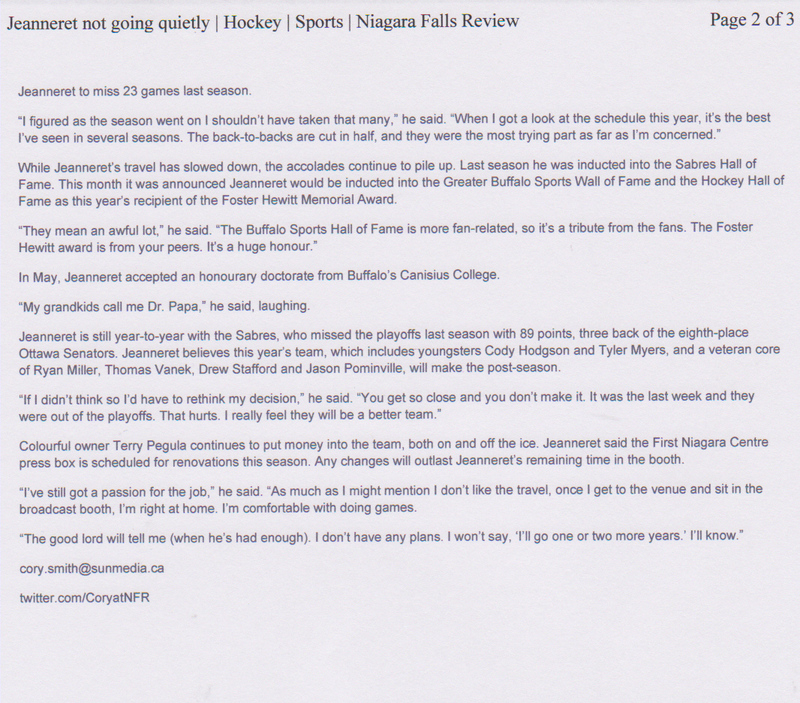 Due to increasing age and health concerns, Jeanneret's retirement has been long rumored. Each year since the 2004–05 NHL lockout, however, Jeanneret has effectively agreed to "one more year." Jeanneret's contract was extended in 2007 through the 2008–09 NHL season. Rick also has two sons, Mark and Chris. His son Mark Jeanneret is the play-by-play announcer for the Erie Otters. 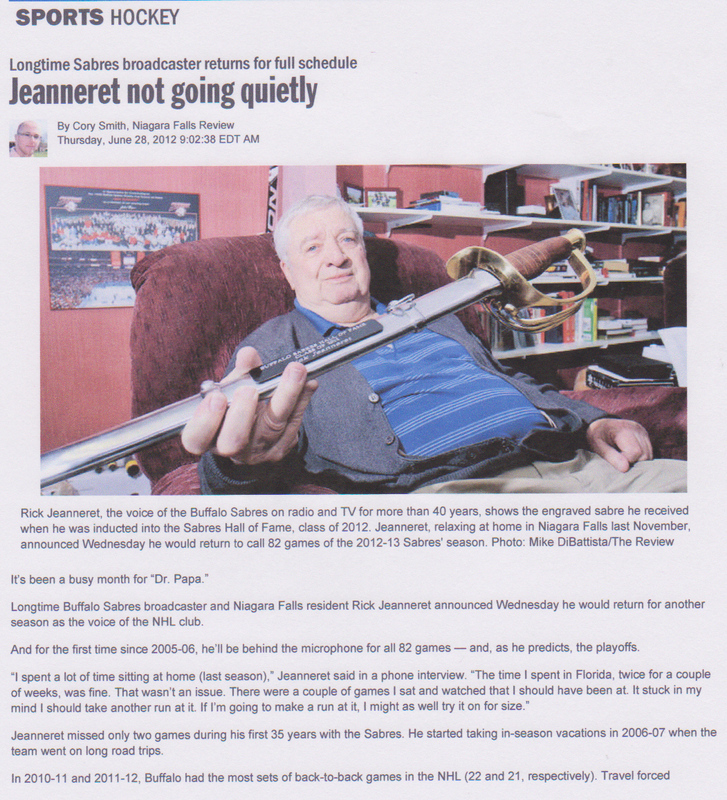 On April 9, 2001, as part of a promotion on radio station WNSA (at the time the Sabres' flagship station), Jeanneret called a fictional game known as the "Sabres Showdown." The fictional matchup was simulated on the NHL 2001 video game, and was said to be a matchup between the 1974–75 Buffalo Sabres and the 1998–99 Sabres, both of whom had been to the Stanley Cup finals. The game was said to have taken place at Buffalo Memorial Auditorium, classic Sabres audio clips were played during intermission, and WNSA purposely held out any regular game staff from the commentary who had actually played on the 1974–75 team so as to make it seem as if they were actually playing the game. (For instance, color commentator Jim Lorentz was replaced by Mike Robitaille, who played for the Sabres in 1974–75 but had been traded before the playoffs, and WNSA hosts filled in other positions.) The 1975 team won the game thanks to Gilbert Perreault's game winning shootout goal. In all actuality, many of the members of the 1974–75 squad are still together, working for the Sabres organization and playing occasionally for the Buffalo Sabres Alumni Hockey Team. Harry Neale to join Rick Jeanneret. WGR 550. 2 October 2007. The original article is from Wikipedia. To view the original article please click here.